Quote: "Relay, electrical solenoid, contactor, etc., call it what one will. Semantics" End quote.. Your saying a relay is the same as a solenoid as a contact?? Electrical is not my strong point but I know a relay is NOT a solenoid. Ant the main starter RELAY is NOT inside the SOLENOID ON THE STARTER.. In my mind they are not necessarily the same. What I am saying is that they can be used interchangeably. By some. Depends. An electrical solenoid can relay electrical current. 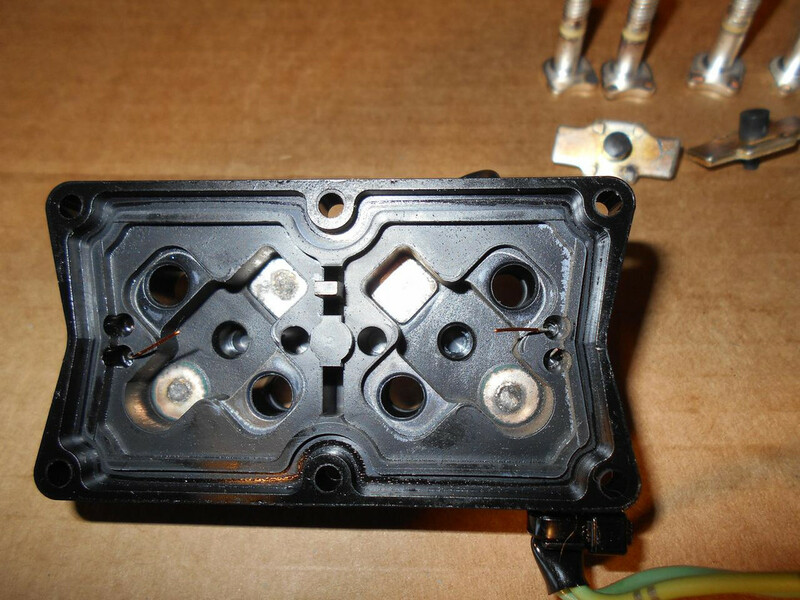 I agree with you that what Yamaha calls the "starter relay" is not the same relay that is located in the mechanism that is located on the starter motor. Ain't the English language grand? Where is rodnut? He likes to debate this sort of stuff. As your picture of a GM (appears to be a GM) starter show's, the SOLENOID to activate and move the starter pawl and gear out to engage the flywheel is integrated into one unit. Atop the starter (with 2 or 3 bolts depending on the model). Jumping the main hot cable to the starter lug (on the solenoid), powers up the starter and engages the pawl (on THAT unit). The old Fords had a starter and the relay (battery cable going to, and a battery cable going direct to the starter) to activate the starter was usually on the inner fender well. We know Yamaha's terminology is inaccurate (translation) sometimes. A relay and solenoid are two very different things. To say their basically the same, no. It just confuses the op (and thread) asking a question using the two words interchangeably.. The F150 (used on many Yamaha's) starter does use a small coil (that's what the small wires Pat was asking about) to pull that plate (pic of mine burned up) to pull all the current. All that current, with time, etc takes it's toll on that plate (as evidenced by the pic I posted). That's all I'm pointing out..
Last edited by TownsendsFJR1300; 02-10-2019, 02:02 PM. In a really broad sense, a solenoid does "work" like (say) opening a valve to allow water flow (like your washing machine) or move a gear like your starter, in that instance it also creates a sturdy electrical connection, a relay does not do work as such, it is simply a "relay" for higher current electrical conductivity in a remote location, common uses are big lights on cars and often the horn, they enable a smaller more manageable wire to run to switches inside the car or boat, in a kind of way they are similar, and often do two things, like your starter, but in truth, they are not the same. What’s everyone’s experience on battery failure between 3-4 years? Too soon? Seems I get a little longer, maybe 5 years, on cars. I have noticed that modern batteries tend to just die with little or no warning "old time" batteries used to be slow for quite a while until they were useless, if you started the car, the battery was OK for most of the day, but no use for a while, you needed a jump start. My previous two batteries just failed, one I got in the car, started fine, drove to a shop, got out and came back a few minutes later and nothing when I turned the key, no lights, nothing, not suspecting the battery, I started fooling around seeing if I could find the problem, after some time I worked out the battery was completely stuffed. Next one was just before Christmas, I drove my Ute (pickup) to get a Christmas tree, parked, got tree, tied it in the back, jump in, lights on dash faint, but no start, went straight to the battery this time, and sure enough, dead, must be how they are manufactured these days? Doesn't it take a relay to tell a slave solenoid to get to work? low voltage to high volts. Actually It was genuine question. Now this one is not. I probably will buy a new starting battery. One battery. Leaving house battery as is. How long till I burn and sink? I only have one battery for my F150, a group 27. I wish I could put a 24 in place of it. That 27 is so darn heavy you can feel it underway in the starboard stern.. This group 27 (Duralast) has been there since 10-2012, much longer than the old 24. I do occasionally do a load test on it with the old style heater coil units. In any event, with the boat on the lift, I have a CTEK charger ( https://autoplicity.com/2764919-ctek...iABEgLtwfD_BwE ) hooked up to the battery that gets flipped on with the dock light nightly..
No, voltage can remain the same, current however can change. is it a potentiometer or a variable resistor? same as aa relay or a solenoid. or even a more accurate,electro-magnetic contactor. typically it is called a relay if it is remotely mounted from the con*****ed device but it does the same thing. now you ask why two relays/solinoids. same reason Volvo,mercloser and most everyone else did. when that Yamaha left Japan it was in a crate/box, semantics. they had no clue if it was going on a 16ft runabout or a 65ft house boat with a hard top and a fwd second station. with a 80ft cable run. so to insure reliable activation and maintaining that activation we use a slave/master setup. so we can use 2-3 amps to control 25 or so amps that will control 350 or so amps. quite simple and used all the time. if you had to control 25 amps with a 40foot cable run your harness would be about 3 inchs in diameter due to the wire size. cable run is the total distance of the circuit. means from the source to the switch to the device. "more accurate,electro-magnetic contactor" Agreed, much more accurate-the magnet pulls the contacts plates (my burned up contact plates) together..